Road rage shooting right by work. Quite alot of talk about it at the office today. 35 south and Judson, on the NE side of SA. Kens 5 put up the news story around 2pm. Re: Road rage shooting right by work. Looks like he was at the Exxon station @ IH 35 & Judson when this went down, still little in the way of details, but they are saying "suspects" drove away after the incident. 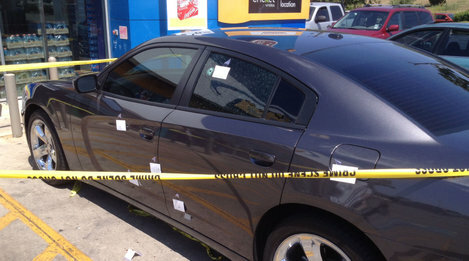 Looks like a few of the rounds went in the left rear window. Looks like they weren't leading the target enough....luckily for the driver! Media's been strangely silent on this one....sure makes me curious! These happen several times a month. My guess this wasn't the choir boy heading to church, so it wasn't big news as far as our media is concerned. Someone owed someone something and didn't want to pay. As Trol said. These are pretty common everywhere. Yep.....about what I'm thinking, as well. Like I said - gotta be more to the story that we haven't heard - but really doubt it's anything about road rage. I am just speculating. But in most cases, it starts as an argument over getting paid.